It’s a common cry from businesses and government that the UK needs more engineers and scientists. During my session at the ASE I looked at the number of students studying GCSE and A-level Physics to see what the scale of the issue is. Looking at the subject choices at A-level, there is a very clear gender divide. At NUSTEM we think this matters, and we’re aiming to do our small part to try to rectify that. We’d like to see more girls study physics and engineering, but also more boys study subjects that are predominantly female dominated. Obviously, we’re focussing on the physics at the moment – hence the name of the project (formerly ThinkPhysics)! Why does the gender divide exist? Look around and it’s easy to see that a child’s world is split into ‘girl things’ and ‘boy things’ from an early age. 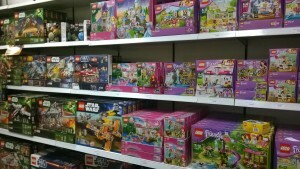 The campaign ‘Let toys be toys’ regularly highlights the lengths to which companies go to label objects as suitable for one gender or another. Lego on display. Note the colours and guess who it’s marketed at. So what can teachers do? The Institute of Physics commissioned research which looked at what schools with higher proportions of girls were doing to encourage that. Amongst the findings of their research was that teaching of physics content was within a context of real life applications, or with career links, encouraged greater gender equity in physics. As part of the session I asked the teachers present to think about the analogies and illustrations that they would usually use to introduce the topics of electric current, pressure and speed and acceleration. I then asked them to come up with other, more gender neutral, ideas. One teacher asked whether it’s possible we might go too far the other way – after all, fast cars are a good illustration of speed and acceleration. In that case, I suggested, make sure that the images you use include female racing drivers. How far do we need to go? The Institute of Physics report ‘It’s different for girls’ looked at gender equality in different types of school in England. They found that, on average, independent girls schools sent around 7% of their students to do A-level Physics. What would that look like in other schools? Doing some simple calculations, for an average sized school, if they have a class of twenty A-level students, they would have five girls doing physics. Just five. Put like that, it perhaps doesn’t sound too bad. And yet, the Institute of Physics also found that 49% state maintained schools sent NO girls to do A-level physics. There is still a lot of work to do. The pdf from the session includes more details of the data, and also some practical ideas for teachers to use in the science classroom. It also explains why there is a picture of the Gateshead Millenium bridge illustrating this post. Think Physics ASE 2015 – Using Physics to Inspire (PDF, 3.1Mb).